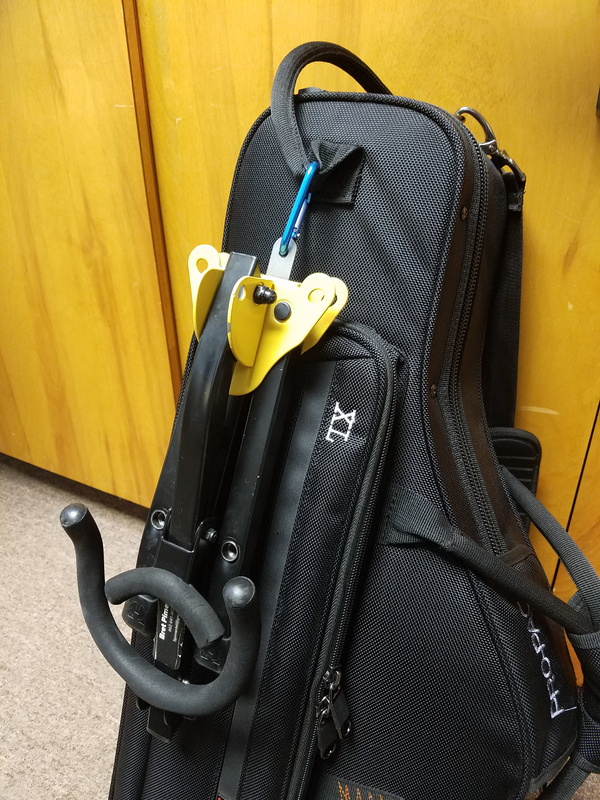 I made a small modification to my Hercules instrument stands so I could clip them onto my instrument cases for easier carrying. …but they don’t quite fit: the holes are too small. 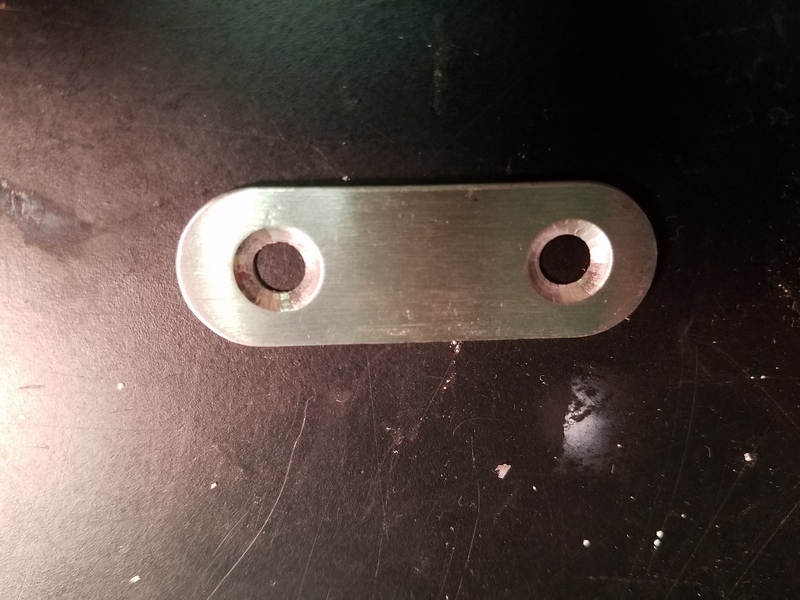 The metal seemed fairly soft and not too thick, so I managed to open up the holes a bit with a handheld drill and a 1/4″ wood-drilling bit. It would probably be safer and more precise to use a drill press and a proper metal-drilling bit. 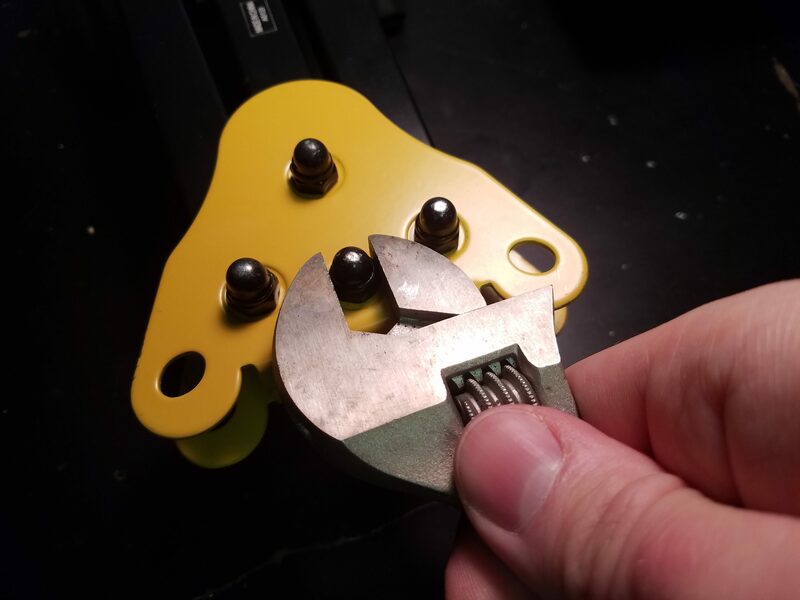 Or, even better, can anyone recommend a premade part with two 1/4″ (65mm) holes about 1″ (3cm) apart, no thicker than about 1/16″ (1mm), preferably without sharp corners? 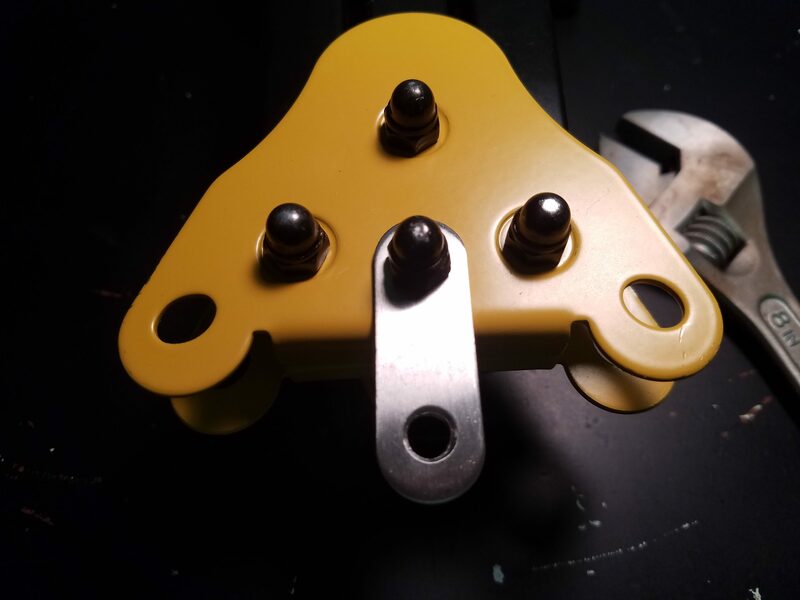 Anyway, with the holes slightly enlarged, put the part in place and replace the nut. This worked well on all my Hercules stands, with a minor modification for the bassoon/bass clarinet stand. 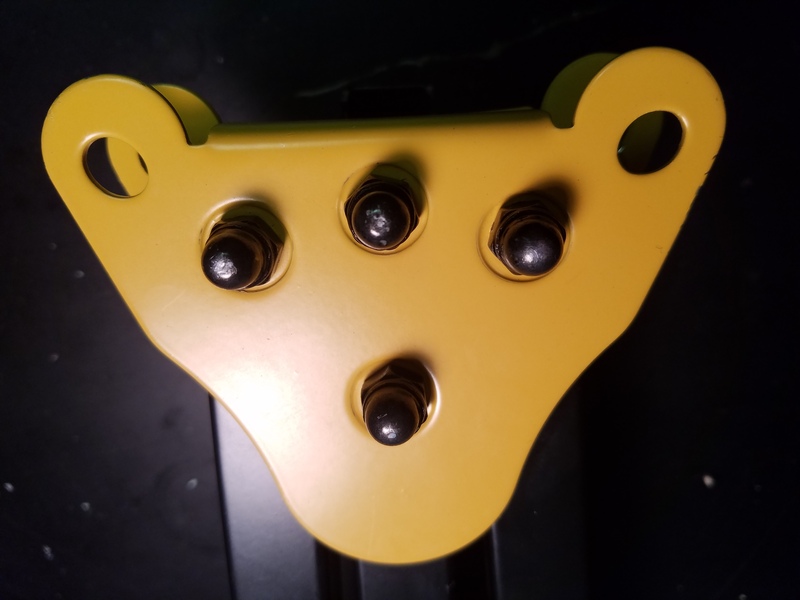 The “forehead” bolt was too short to get the nut back on with the extra piece in place, so I installed it off-center. It works fine. I’d be curious to hear about your favorite equipment modifications in the comments. I’ve had a König & Meyer bassoon/bass clarinet stand for years now, and recently picked up the Hercules version and tried it out on some gigs. I was hoping to form a strong opinion and make a nice clear recommendation here between the two. But the bottom line is that both are really quite usable. The exact model of K&M stand that I have doesn’t seem to be in production anymore. There is a newer one with a black finish (nice for onstage use) and slightly different hardware. I would be interested to hear if anyone is aware of any significant difference between the older and newer models. I don’t have any concerns about either stand scratching my instruments. The K&M has a rubbery cup for the bottom of the instrument to sit in, and a felt-covered brace at the top. The Hercules has a harder (but not hard) plastic cup and a foam-covered brace. The K&M’s large, soft, and somewhat grippy cup is a nice feature for quick instrument switches. The Hercules’s I wouldn’t trust quite as much—I would need an extra moment to be sure the instrument is secure. The Hercules has room to add a couple of additional instrument pegs, which is a nice feature for doublers. Note also that the Hercules’s cup can be rotated 180° from the way I have it oriented, if desired. It is mounted on a leg that is adjustable, which I suppose you could use to change the angle of the instrument on the stand. I like it at full extension for maximum stability at the base. For quick switches, I like to be able to play bass clarinet with its peg still in the stand if needed. Both stands accommodate this without any trouble. Upper braces on both stands are height-adjustable to about the same height. At around full extension the braces are out of the way of keys on the bassoon’s long joint (the bell key is on the side where the braces don’t touch it). Neither quite adjusts as high as I would like for a low C bass clarinet (with the peg extended a little), so unfortunately for me the left index A and A-flat keys rest against the brace. Both stands fold up, but neither is tiny. 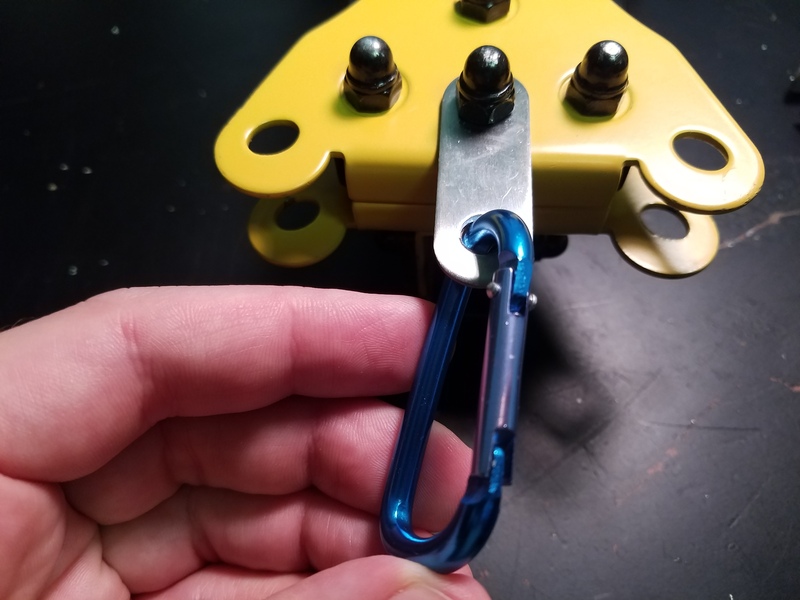 The Hercules is more portable if you remove the cup, but that means fussing with a wing nut and then having one extra piece to carry around (or lose). The Hercules does win on price, at about 60% of what the K&M costs. Overall, I guess I lean toward the Hercules a little for bass clarinet, mostly because I could add, say, pegs for B-flat and E-flat clarinets and be ready for a utility clarinet gig. And I like the K&M slightly better for bassoon because its larger, softer cup makes a better target during a quick instrument switch. If you’re still torn, the Hercules’s lower price point may be a good tiebreaker. 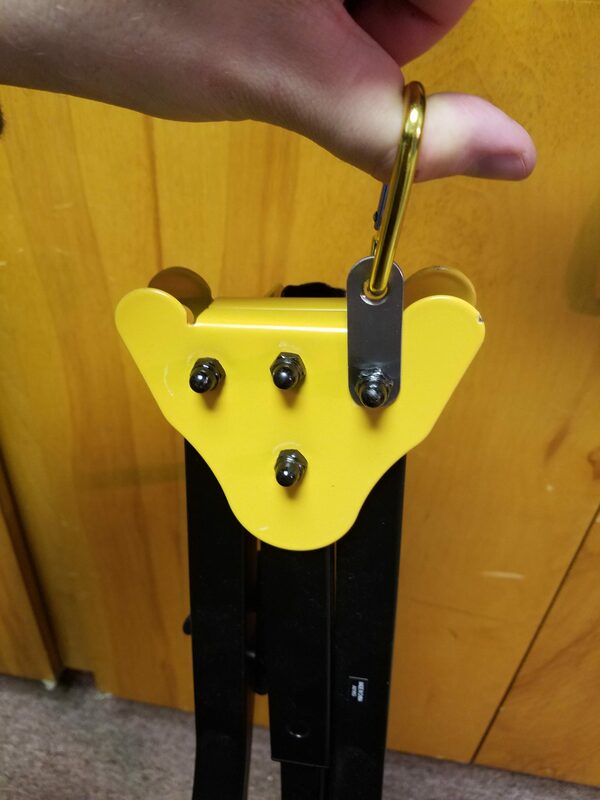 A few months ago I did a review of the Hercules DS538B dual-saxophone stand with flute/clarinet and soprano saxophone pegs. Despite my poor photography, you can gather that it folds up to just over a foot long. It also includes a bright yellow drawstring bag, and the string makes it a little easier to carry if you’ve already got your arms full of instruments. The DS602B “Deluxe” peg, which Hercules indicates is for “French/German Clarinets and Flutes,” is quite good. It works for my clarinets and oboe as well as the standard combination pegs that come with the DS538B, and works much, much better for my flute. 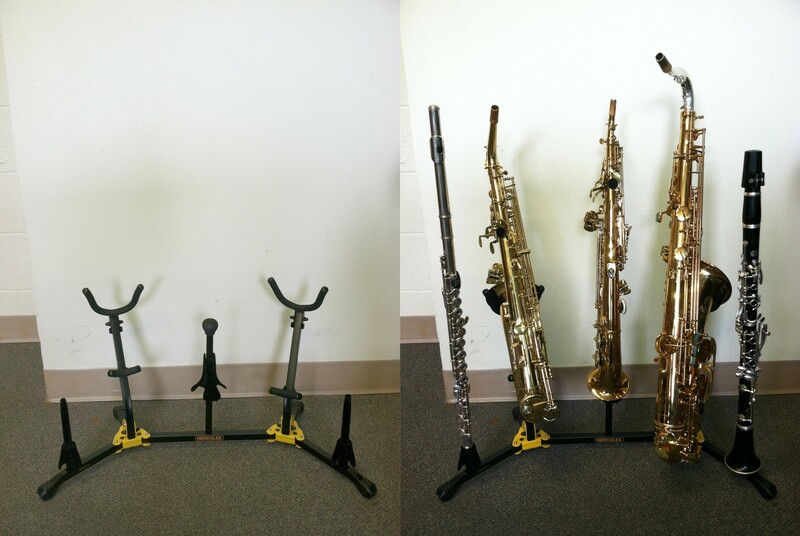 After my recent glorious victory in the Saxquest trivia contest, I had a gift certificate burning a hole in my pocket and I decided to get a new stand to hold my saxophones and perhaps some other woodwinds in my office and on gigs. I had been tempted previously by SaxRax stands, which I continue to hear good things about but haven’t been able to try out seriously in person. I find it difficult on SaxRax’s website to find out exactly what products they are currently making; I had to use their contact form and wait for a response to determine that their single alto and tenor stands can no longer be joined with a special connector, and the double flute-clarinet peg is no longer made (though some old stock are apparently still available). 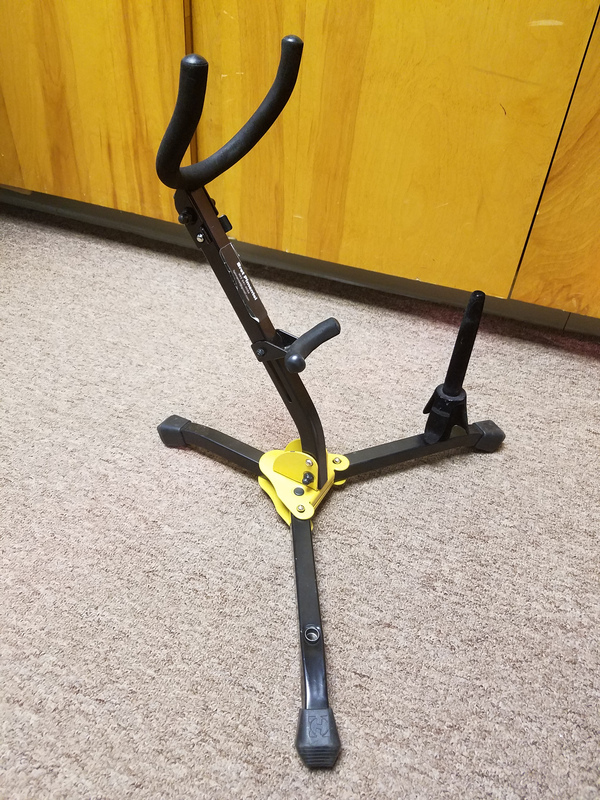 I had hoped to buy a single saxophone stand and eventually build onto it with a second, but now you have to buy a combo alto-tenor stand, and that is currently out of my price range. Next on my list were the stands by Hercules, which are more expensive than the various cheap stands but considerably less costly than the SaxRax. Hercules’s website is very clear about what products they make. I settled on the DS538B, which holds alto and tenor saxophones, and includes a soprano saxophone peg and two flute-or-clarinet pegs. Saxquest currently sells them for USD $69.95, plus a fairly steep shipping charge (the stand is a little heavy, I guess). It has yellow trim. Not on the pegs, which might be useful in the dark, but on the base, where its only function is to call attention to itself (and perhaps provide a little free advertising). The reason we make the yellow trim eye-catching is to prevent stumbling over the stand or instrument on the dark stage.